SILVER SPRING, Md. (July 20, 2017) — The nonprofit International Partnership for Microbicides (IPM) announced today that it has received a £12 million (US$15.6 million) award over four years from the United Kingdom (UK) government through the Department for International Development (DFID) to advance promising HIV and multipurpose prevention products that women could use to protect their sexual and reproductive health. The UK aid grant will support regulatory, licensure and market introduction activities for IPM’s monthly dapivirine vaginal ring, which IPM developed with support from previous UK government awards and other donors. The ring is designed to offer a discreet, long-acting and affordable HIV prevention option for women, who insert and replace the ring themselves every month. Last year, the ring became the first microbicide shown to reduce women’s HIV risk in two large clinical trials. IPM recently submitted the product for review to the European Medicines Agency and plans to submit applications next to the South African Health Products Regulatory Authority (formerly the Medicines Control Council) in late 2017 and to the US Food and Drug Administration in 2018. Following potential WHO pre-qualification, IPM will also seek regulatory approval in African countries where women face the highest HIV risk. In addition, the award will fund the development of next-generation microbicides that build on IPM’s dapivirine ring technology. These include a three-month dapivirine-only ring that would offer women greater convenience and lower costs, and a three-month dapivirine-contraceptive ring, designed to offer simultaneous protection against HIV and unintended pregnancy, that recently entered its first clinical trial. HIV/AIDS and unintended pregnancy are two of the leading threats to women’s health, particularly in developing countries. In sub-Saharan Africa, women make up nearly 60 percent of adults living with HIV/AIDS, and young women are as much as three times as likely as young men to become infected. An estimated 214 million women in developing countries wish to use but lack access to a modern contraceptive method. 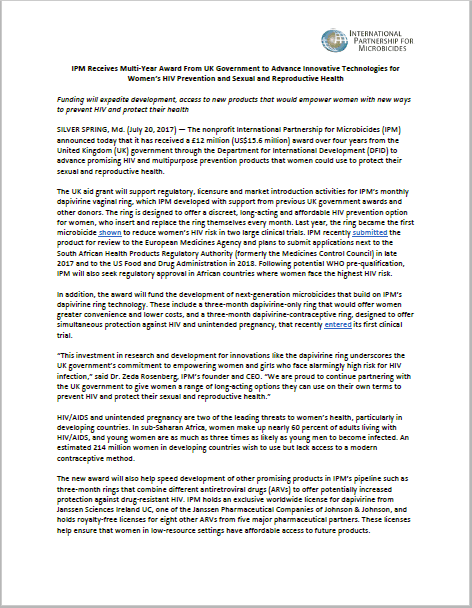 The new award will also help speed development of other promising products in IPM’s pipeline such as three-month rings that combine different antiretroviral drugs (ARVs) to offer potentially increased protection against drug-resistant HIV. IPM holds an exclusive worldwide license for dapivirine from Janssen Sciences Ireland UC, one of the Janssen Pharmaceutical Companies of Johnson & Johnson, and holds royalty-free licenses for eight other ARVs from five major pharmaceutical partners. These licenses help ensure that women in low-resource settings have affordable access to future products. The UK government through DFID is one of IPM’s founding donors, and this is DFID’s fifth grant to the nonprofit, bringing UK aid’s total investment in IPM to £55.7 million. IPM also receives generous support from the Flanders Department of Foreign Affairs, Irish Aid, the German Federal Ministry of Education and Research (BMBF) through the KfW Development Bank, the Ministry of Foreign Affairs of the Netherlands, the American people through the United States Agency for International Development (USAID) through the US President’s Emergency Plan for AIDS Relief (PEPFAR), and the Bill & Melinda Gates Foundation. About IPM: IPM is a nonprofit organization that developed the monthly dapivirine vaginal ring, and is dedicated to developing other new HIV prevention tools and sexual and reproductive health technologies for women, and making them available in developing countries. Our partnerships with public, private and civil society bring scientific ingenuity, political will and financial resources to bear on developing and delivering products designed to have significant public health impact. IPM has offices in South Africa, the United States and Belgium. Visit us at www.IPMglobal.org.